At the centre of Wroclaw lies the large medieval market square (Rynek in Polish), which is surrounded by grandly renovated town houses. 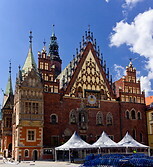 The market square was set up starting in the 13th century. By the 14th century the limits of the square had been set by buildings. 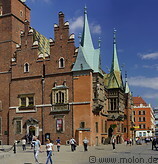 The beautiful town hall (Ratusz/Rathaus) was built over a period of 250 years from the end of the 13th century until the middle of the 16th century. The market square is nowadays a pedestrian area.